Is it Beauty or Blotch? 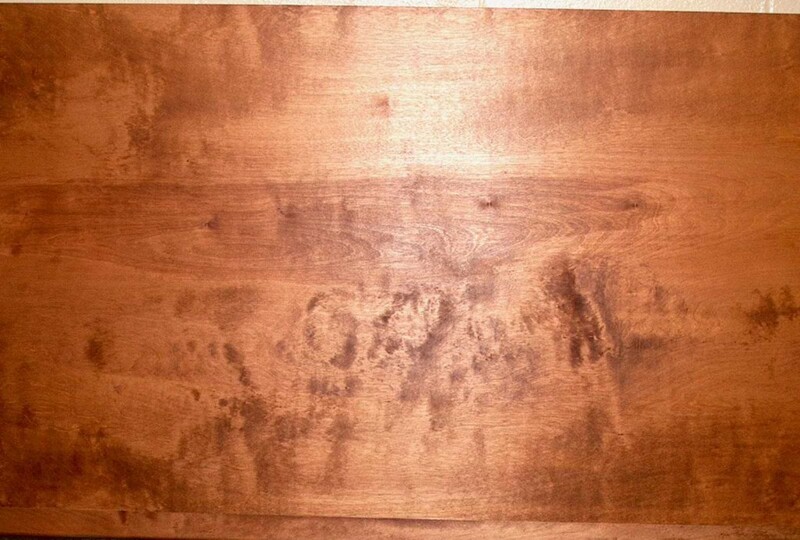 When a dye, pigment stain or oil is wiped onto raw hardwood, the wood can develop an uneven color. Like many hardwoods, maple can show blotchy figure, and birch can show curly figure, both as solid wood and as the surface veneer of hardwood plywood. In both pictures, the light and dark areas are due to the wood’s having an uneven rate of absorption – the darker areas absorb more color and/or oil. Although they were probably different in these two pictures, it is possible that a similar sequence of color and finishing steps were applied to the maple and birch. When the uneven rate of absorption is very regular, as in the first picture, many will say the finisher was especially skilled. When the uneven rate of absorption is irregular, as in the second picture, some will say the finisher was unskilled. Both pictures show the natural response of hardwood to wiped color and/or oil. Not infrequently I’m asked “why bother working with raw veneer.” For example, commercial walnut plywood is ready to use, while raw walnut veneer leaves have to be ordered, trimmed and edges jointed, taped into sheets, the sheets glued to a substrate, and the surfaces then sanded. A conceptual bookcase project may help explain the difference. The bookcase will be in the middle of a long wall. It will have a lower section with doors, and a set-back upper section with open adjustable shelves. The doors of both examples will have panels faced with crotch figure. Plywood will be used for the sides and back of both the lower and upper sections, and the shelves. Solid wood will be used for the face frames and doors. Using commercial walnut veneer, joints in the veneer likely will not be symmetric across the backs and sides. Almost certainly the grain pattern and figure will not be consistent across the inner and outer surfaces of the sides and the visible back of the upper section. The crotch veneer on the door panels may be gorgeous but too visual for the veneer on the hardwood plywood. A stain and glazing may be advised to make less noticeable the differences in grain pattern and figures on the various plywood surfaces. The lasting visual image may be the dark finish and not the wood. After ten to fifteen years the dark finish may be considered a dated look and plans inititated for yet another bookcase. By starting with raw veneer, the width and length of the raw veneer are chosen for the bookcase dimensions, and the leaves trimmed so that joints between the leaves are balanced and symmetric across the sides and backs of the lower and upper sections. Bookmatched ropey quartersliced veneer could be used for the sides and backs to produce intriguing arrow or chevron patterns for added visual interest. Walnut burl accents could be incorporated in the corners of the lower and upper sections to further tie them together. And the crotch veneer door panels will look more part of a whole when matched with the bookmatched ropey walnut and burl accents. A clear finish over oil would be appropriate to highlight all the character and beauty of the walnut wood. The lasting visual impact of this bookcase would be the combination and use of figure and the wood itself. This bookcase would be likely to become a family treasure to be kept for decades and desired by the next generation. One of the benefits of veneer is the seemingly endless variety of textures, grain patterns, colors, and figures. 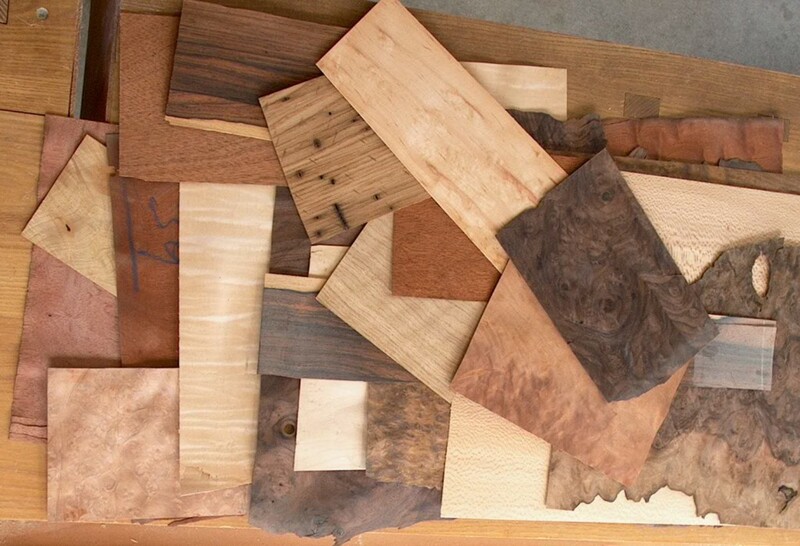 This collection of samples includes quarter sliced and flat sliced grain patterns; a piece sliced from a wormy log; burl, crotch, waterfall and mottle figures; and a wide range of colors. Commercially produced veneer is sliced from a solid piece of wood, conceptually like the meat slicer in a delicatessan, so there is no waste. The bottom surface of one slice of veneer is an exact copy of the top surface of the next slice. 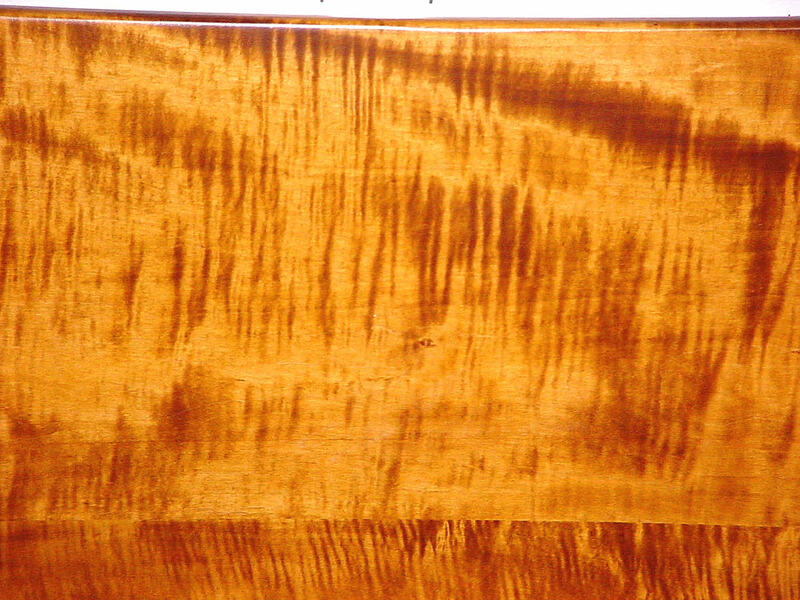 Some of the solid wood from which these veneers were sliced are too unstable to be used as solid wood – they would undergo too much seasonal expansion and contraction, and sometimes warping, to be incorporated in furniture. Additionally, burls, which are roundish growths sometimes seen on the side of a tree, are very decorative but small – several consecutive slices often are brought together edge to edge to create the needed length and width. From initial slicing to a distributor and on to the end purchaser, veneer is always kept in sequence. 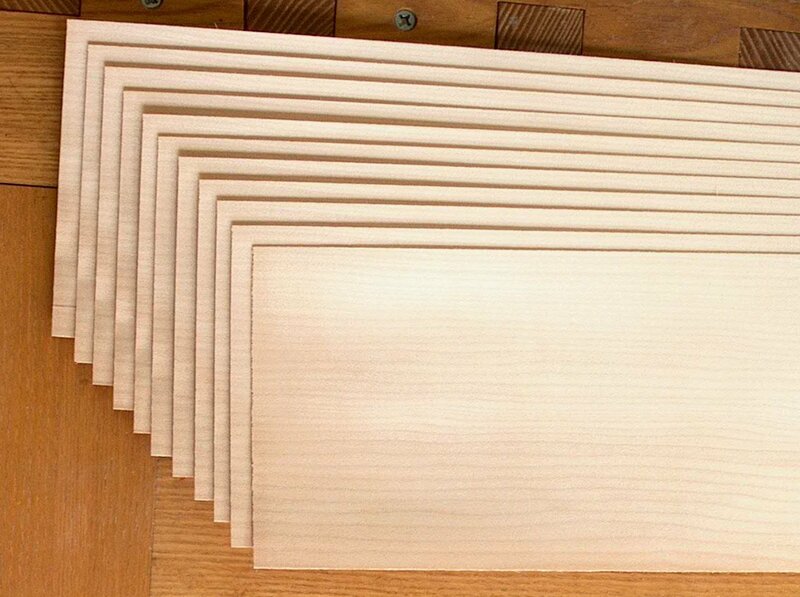 This picture one end of eleven sequential sheets of quarter sliced maple veneer, each about 110″ x 5 1/2″. In use, veneer must be glued to a backer or substrate as it is too thin to have any strength of its own. But it offers an amazing design range for custom furniture. There are several commercial suppliers of veneer. The one I’m most familiar with, www.certainlywood.com, has its complete inventory in pictures on line under their “Wood Menu” tab for anyone who would like to see more of the woods, figures and colors that are available. Click an individual post title for social sharing buttons. Do Your Traditions Include a Family Meal? Why Not Equality for Wood?